Mother Nature threw all teams a curve ball with a strong southwest wind to start the day. The wind changed to the north and settled down a bit making fishing a little more bearable. Doug McDaniel and Andy Doom took first place honors weighing in an 11.57 lb basket, including the big walleye of the tournament, a 9.24 lb walleye. Their basket was good for $2200 for first place, $300 for biggest walleye and $570 for first in the option pot. Tim Judovsky and Kelvin Weber took second place with an 11.33 pound basket good for $1400 and $342 in the option pot. Third place went to Rick Hoium and Bob Hoium who weighed 10.87 lbs good for $900 and $228 in the option pot. 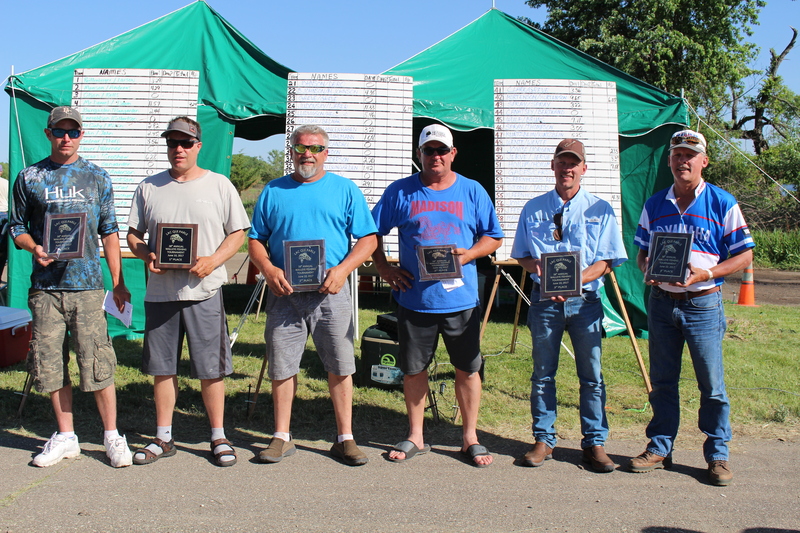 Fourth place was John Jerve and Paul Jerve who weighed 10.74 lbs and second biggest walleye of the tournament an 8.39 lb walleye, good for $600 and $200 for second big fish. Fifth place went to Chad Mortenson and Raven Mortenson who weighed 9.65 lbs. Sixth place went to Chad Hiepler and Dylan Hiepler who weighed 8.61 lbs. Seventh place went to Jake Bednar and Ernie Thorpe who weighed 8.56 lbs. Eighth place was Corey Reiffenberger and Paul Larson who weighed 8.29 lbs. Ninth place went to Aaron Wulf and Nick Bruns who weighed 7.11 lbs. Rounding out the top 10 was Jeff Sather and Ron Sather who weighed 6.84 lbs. Grady Fernholz received the prize for youngest entrant in the tournament. Thank you to all the teams who participated in the tournament. Also a special Thank You to Susan Stensrud for an outstanding job as tournament director and the many volunteers who made this tournament happen. First Place: Andy Doom, Doug McDaniel. Second Place: Tim Judovsky, Kelvin Weber. Third Place: Bob Hoium, Rick Hoium.